If you want to make sure you’ll still be able to use the Internet when you wake up Monday morning, go to this website right now, click “Detect,” and follow the instructions from there. 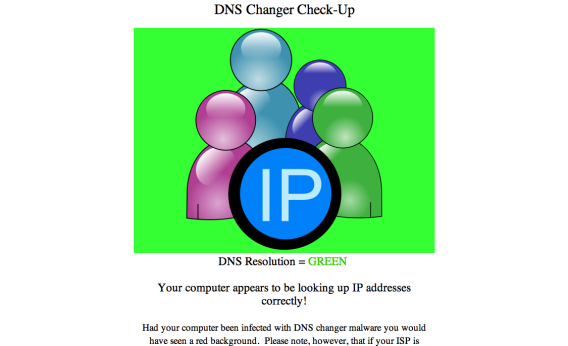 That’s the website of the DNS Changer Working Group (DCWG), set up by court order to fix a bunch of servers that had been taken over by an Estonian crime ring. The ring, which was busted last November, had been using the servers to redirect millions of Internet users to rogue websites when they tried to visit normal websites. The FBI took over the servers and cleaned them up, but it doesn’t particularly want to be in the business of running DNS servers permanently—so it’s shutting them down on July 9. The date has been dubbed “Internet Doomsday” because everyone still using those servers will lose pretty much all access to the Web once the FBI takes them down. The name is a little hyperbolic, given that only a few hundred thousand people are still on the servers. Still, it’s probably best to make sure you aren’t one of them. If you were, there’s a good chance you would have realized at some point last year that some normal websites were looking a bit odd, filled with pop-up ads or trying to sell you things you didn’t want. But hey, the Internet is an odd place, so it’s possible you didn’t notice the difference. If so, the DCWG website should be able to tell you for sure. Or you can go straight to the source and type your DNS information into a website set up by the FBI. If your machine is one of those infected, the DWCG site will help you fix it before Monday arrives. Security firms like Norton also offer products to help wipe this type of malware from your machine—though you’ll still need to fix your DNS settings if you’ve been infected.